The tanker MARY A. WHALEN is an atmospheric, nautical location. Great variety of exterior and interior shooting spaces. Uncluttered 90’ main deck. Additional fore and aft decks. Several interior spaces with removable skylights allowing lighting or camera booms to work from outside the space. Roomy captain’s cabin has portholes accessible on all 4 sides for similarly easy lighting and shooting. Large wheelhouse with shooting access on 3 sides. Fantastic kitchen is a half circle 31 ½ feet wide. Ship is 172 feet long, 31 ½ feet wide. Our location is here in Red Hook, Brooklyn, next to the Brooklyn Cruise Terminal and Pioneer Works. Ship can be moved for shoots. Last of her kind in the USA, built in 1938, and undergoing restoration. Location fees benefit the non-profit organization PortSide NewYork based on the ship. This page and brochure of photos will be updated soon! The ship is undergoing extensive restoration. The decks have been repainted since these photos. 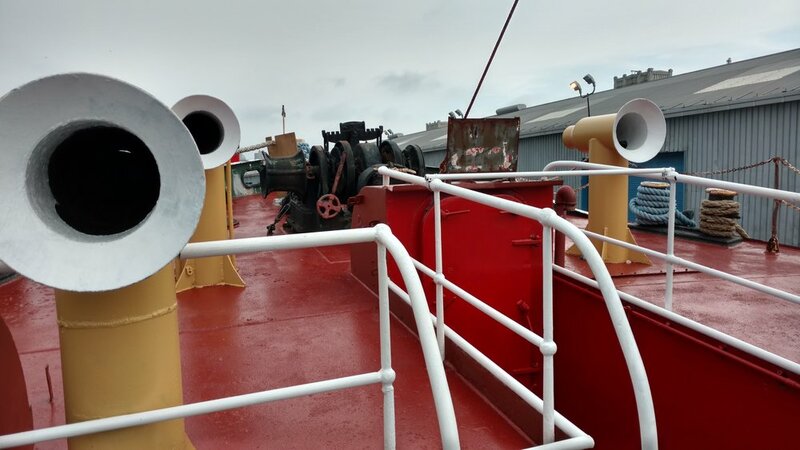 The fidley (the large space over the engine room) and companionways to and from it are being repainted. The wheelhouse woodwork is currently under restoration with the wood windows and doors removed. Nylon Magazine Chanel resort wear shoot as an article and photos in a PDF. Zayn Malik in the galley during the interview for the GQ cover story, June 2018. Fantastic galley (kitchen) is a half circle 31 ½ feet wide. Ship is 172 feet long, 31 ½ feet wide with a raised deck 90’ long and half the width of the ship down the center of that. PortSide NewYork is a living lab for 21st century urban waterways. Our focus is the water part of the WATERfront, the BLUEspace,or NYC's Sixth Borough. Our programs, services and advocacy show how to combine the working waterfront, public access and community development. Our mobile program unit, the historic ship MARY A. WHALEN, holds our offices and is the site of many of our programs. We are located on Pier 11, Atlantic Basin next to the Brooklyn Cruise Terminal in Red Hook, Brooklyn. Our education, culture, workforce development and neighborhood promotion programs - all on a water theme - bring the communities ashore and afloat together, for the benefit of all.